China, Zhou Dynasty. Lan or Zheng type square foot spade. ca. 350 to 250 BC. 1/2 Jin. 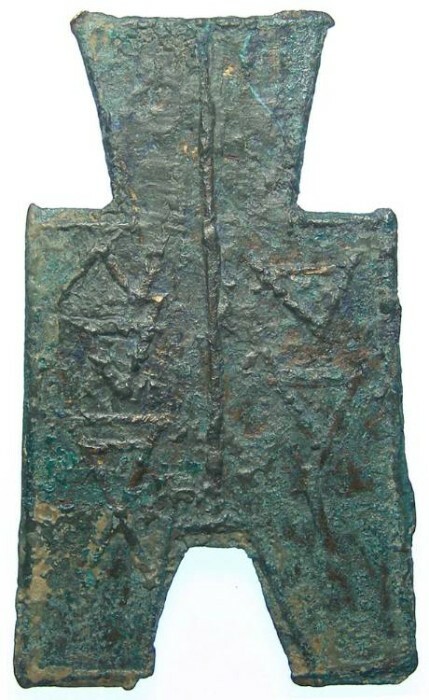 Denomination : Bronze 1/2 jin square foot spade. Date : These are dated to the later Zhou Dynasty, ca 350 to 250 BC. Mint : The reading of the characters on this type are as yet uncertain, so the mint and state of issue have not yet been identified for this type. Reference : Hartill 3.454. FD-207. Size : 46.3 x 27.5 mm. Weight : 5.78 gram. Grade : VF but the obverse has been badly cleaned with signficant scrap marks on the surfaces. They did not go all the way through the patina, so it should be possible to redo the cleaning and improve it, but this is not something I would try myself. The reverse is very natural. Obverse : The characters on this type have been translated as both "LAN" and "ZHENG" and as yet know one has been able to confirm which is the correct reading. Reverse : one vertical and two oblique lines as is usuall on most types in this series. Provenance : ex Klaas Kruit collection.